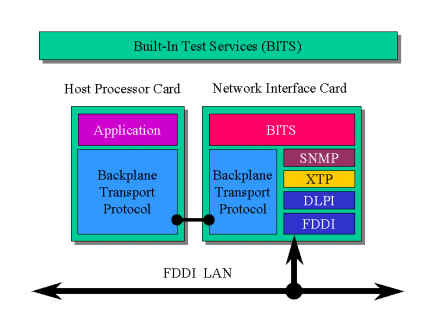 The Built-in Test Services (BITS) in conjunction with the Network Management Station (NMS) provides real-time monitoring (integrity checking) and dynamic configuration control of the entire networked system, event and alarm reporting, statistical performance measurement, comprehensive diagnostic facilites, computer-assisted trouble shooting and maintenance. Network Management consists of two levels; the lower level implementing network management functions and the higher level implementing system health monitoring. Lower level network management functions consist of Managing Applications and Managing Agents. The managing application manages managed objects by means of management agents. It derives data from the managed objects by means of a LAN-based network management protocol (i.e. SNMP) and stores this data in a Management Information Base (MIB). The data in the MIBs is then processed to provide user level management information by means of the NMS man-machine interface. The management agent performs management operations on managed objects and produces notification of events on behalf of managed objects within the node in which it resides. It acts as an intermediary between the managing application and the entities which have managed objects within the node. The Nework Management Station provides higher level system health monitoring and provides online monitoring and control of the entire network system, reconfiguration management and high-level diagnostics facilities. For maintenance crew manned systems the NMS provides extensive man-machine interface functionality. It supports an operator's console which provides graphics-based, diagrammatic visualisation of the system and its network components. The display provides high resolution colour graphics and interacts with pointing devices such as mouse, trackball or joystick. The NMS consists of hardware and computer software components. The hardware component provides physical connectivity to the LAN as well as providing a processing platform for the NMS software component.